So, tomorrow is kind of a big day for me. It's the day I FINALLY get to see the amazing, fantastic, OMGI'MGOINGTOSPONTANEOUSLYCOMBUSTI'MSOEXCITED 50th Anniversary episode of my favourite programme of all time: Doctor Who. There'll be Matt Smith AND David Tennant (be still my heart) AND John Hurt (HIS VOICE!) and Clara and Rose (ROSE!) and daleks and fezes and it's going to be THE BEST THING OF ALL TIME. OF ALL TIME. So I've put together a silly-but-fun cocktail to celebrate. And, after seeing the snippet on Children in Need last Friday, one thing I do know about Saturday's episode is there's going to be some more of that legendary fez involved, worn by BOTH the 10th and 11th Doctor. 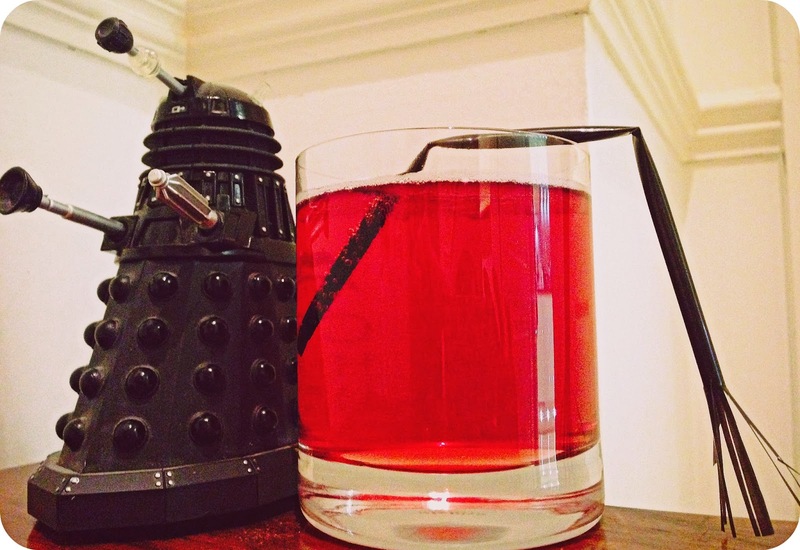 So what better way to celebrate Doctor Who's 50th anniversary than a fez cocktail? A fizzy fez cocktail. With a straw tassel. I'm pretty chuffed about this because it also tastes bloomin' delicious. It's always good to combine flavours like cranberry and raspberry and orange, but the sparkling wine adds a little decadent celebratory feeling and the port adds a whoomf (totally a word) of warmth and extra fruity flavour. They all combine to make a beautiful red colour, no grenadine required. 1. Add all the ingredients except the sparkling wine to a cocktail shaker. 2. Shake it like the TARDIS in a time vortex. 3. Add the sparkling rosé and swirl gently to combine. 4. Pour into an old-fashioned glass. 5. Snip the ends of a straw so they flare out like a tassel, and bend so it will sit on top and drape over the side of the glass. Add to the glass. (Obviously, do not drink from this straw. It will get messy). What are you doing to celebrate 50 years of The Doctor? Tell us in the comments, or on our Twitter and Facebook pages!